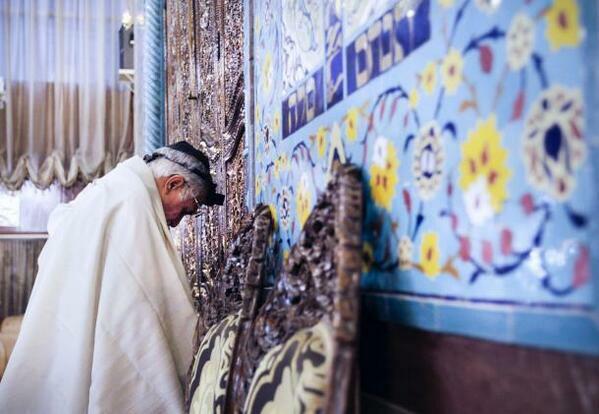 Iran's new Foreign Minister Javad Zarif joined President Hassan Rouhani in tweeting “Happy Rosh Hashanah” greetings Thursday, on the occasion of the Jewish new year's holiday, setting off a new wave of amazement, and some disbelief, in both the social media and policy universes. Separately, Rouhani on Thursday announced that the Iran nuclear negotiating file has been moved to the Foreign Ministry from the Supreme National Security Council. The State Department said Thursday that it had seen the reports on the nuclear file transfer to the foreign ministry, and reiterated its hope for swift, substantive engagement leading to a diplomatic resolution with Iran over its nuclear program. Nuclear negotiations are expected to be discussed in New York on the sidelines of the United Nations General Assembly this month, that both Zarif and Rouhani will attend. Zarif is expected to hold meetings there with chief international nuclear negotiator, European Union foreign policy chief Catherine Ashton, British Foreign Minister William Hague, and Russian Foreign Minister Sergei Lavrov, Iranian media reported Thursday. The stunning exchange of direct Twitter diplomacy from Tehran that began Wednesday with Rouhani wishing Jews everywhere a blessed Rosh Hashanah has set off amazement in the social media universe. It has also revealed a deep vein of wariness and mistrust, that remain a legacy of former Iranian President Mahmoud Ahmadinejad's Holocaust denial and threats to Israel, and the avowed hostility between Israel and Iran. 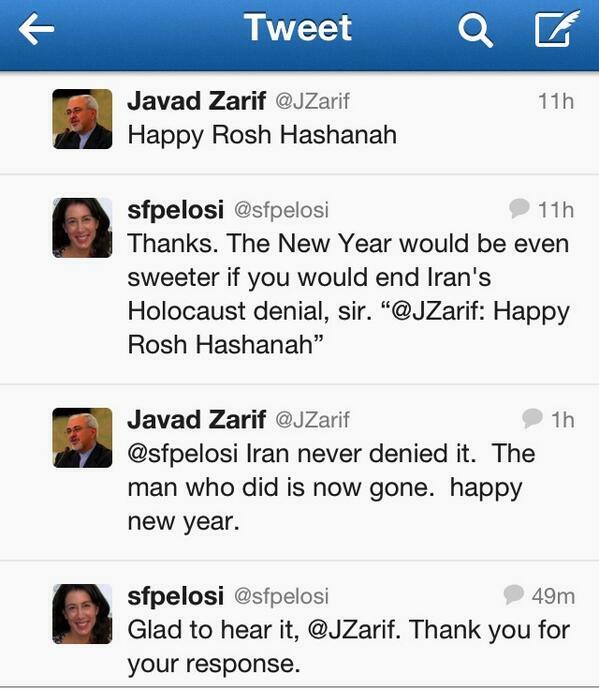 Zarif's Rosh Hashana greetings–only his second tweet since opening an account (@JZarif) earlier this week that has still not been officially verified–soon led to a stunning Twitter exchange with Christine Pelosi (@sfpelosi), the daughter of ranking House Democrat Nancy Pelosi, about Ahmadinejad's Holocaust denial. @sfpelosi Iran never denied it. The man who was perceived to be denying it is now gone. Happy New Year.